If you live in an area of the world where you get more than a dusting of snowfall, then you might want to invest in a snowblower. If that snowfall is significant and your driveway often gets blocked in by large piles of icy snow pushed aside by snowplows, then you might want to invest in a powerful snowblower like a Honda snowblower. All Honda snowblowers come equipped with a Honda four stroke engine that is easy to start and extremely reliable in cold weather. Honda makes ten different models of snowblowers, and all ten are powerful enough to tackle those heavy icy piles of snow. The Honda snowblowers also throw the snow faster and farther than most snowblowers on the market. Honda snowblowers can be divided into two categories including compact single stage models and more powerful two stage models. The single stage models can throw snow up to twenty six feet while the two stage models might throw it as far as fifty six feet. 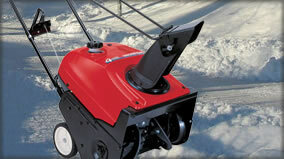 More details about the various Honda snowblower model available are below. There are two different single stage Honda snowblowers. The only difference between the Honda HS520A and the HS520AS is that the HS520AS model has an electric starter for even easier startup on a cold winter morning. These small but powerful snowblowers by Honda can move up to fifty five tons of snow in an hour. This Honda snowblower has a twenty inch path and can throw snow up to twenty six feet depending on the type of snow. Equipped with the same engine design as all Honda snowblowers, this snowblower will run cleaner and more efficiently than other gasoline powered snowblowers. They will run on thirty percent less fuel than a comparably sized engine on other design. Two stage snowblowers have not only a flat paddle auger to discharge snow like the single stage machines, they also have a fast spinning impeller at the discharge duct that allows the snowblower from Honda to throw the snow farther and faster. All eight of the two stage models have heavy duty serrated augers to help break up ice and packed snow. They also come equipped with a discharge chute that can be positioned to throw the snow exactly where you want it. There is an over two hundred degree range in rotation and a seventy degree range in elevation. Another thing that all six two stage snowblowers have in common is the hydrostatic transmission. This transmission allows you to control the ground speed of the Honda snowblower without affecting the auger speed. A single lever allows you to increase speed by pushing it forward. The first two snowblowers in the two-stage category of Honda snowblowers are the HS724WA and the HS724TA. These machines are both larger than the single stage Honda snowblowers with a twenty four inch path and the ability to throw snow up to forty six feet away. The two models differ in three ways. First, the HS724TA has what Honda calls track drive and the HS724WA has wheel drive. The wheel drive comes equipped with Sure Grip tires that eliminate the need for snow chains. The wheel drive can move up to 46.3 tons of snow per hour and has a larger clearance of over twenty inches. The track drive by contrast has a set of rubber tracks with sure-gripping cleats rather than wheels, can throw snow at 50.7 tons per hour, and has a smaller clearance of sixteen and a half inches. Neither of the HS724 models comes with an electric starter. The next four models are slightly larger than the 724 models. The HS928 has a twenty eight inch path and can toss snow up to forty nine feet. The four models include two track drive models and two wheel drive models. Each track variety has a model with an electric starter. The HS928TA has track drive while the HS928TAS has the track drive with an electric starter. The HS928WA has wheel drive and the HS928WAS has the wheel drive with an electric starter. All four models move approximately 55.1 tons of snow per hour. 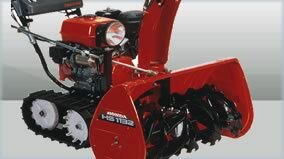 The last two models of Honda snowblowers are for homeowners who need to move a massive amount of snow quite regularly. The HS1t132TA and HS1132TAS can move almost seventy two tons of snow per hour with a thirty two inch path. The HS1132TAS has the electric starter, but both models come with the dual track drive.